Salvador de Bahia – Cheap Rooms in Salvador de Bahia. Maps of Salvador de Bahia, Photos and Reviews for each cheap room in Salvador de Bahia. Looking for a hostel in Salvador de Bahia? Look no further, all the good deals in Salvador de Bahia are on Dorms.com. Like thousands of other people every month, book your hostel securely at the best price in all neighbourhoods of Salvador de Bahia. On this site, you can easily find a hostel downtown, in a trendy neighbourhood; a hostel in the student- university district, close to bus or train stations, airports or major attractions of Salvador de Bahia. Hotel Sobrado 25 is located in the heart of the historic city centre, a large outdoor mall, as it offers numerous artistic and musical attractions. There is a concentration of bars, restaurants, boutiques, museums, theaters, churches and other monuments of great historical value. 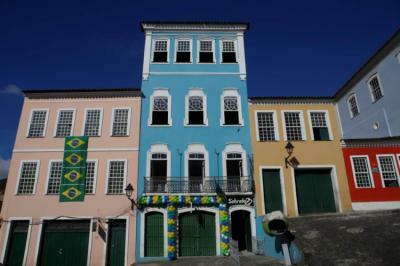 Now it is colorful and revived Pelourinho, full of cultural activities and events, especially at night. There are also the rehearsals of the Olodum group, every Sunday and Tuesday.